A relative newcomer to the world of glass and crystalware, Lasvit was founded in 2007. However, in a few short years it has established itself as an authority in custom-made lighting sculptures and glass art installations. 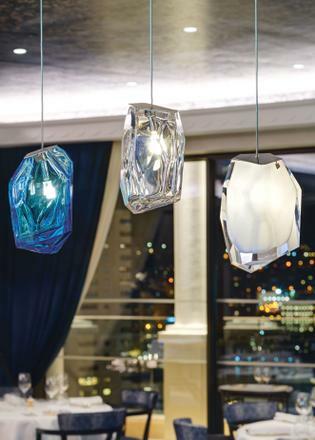 The company has worked with some of the most regarded designers in the field to create bespoke lighting structures, and its work can be found on some of the most notable superyachts in the world. The vision of Czech entrepreneur, Leon Jakimič, who set out to create a dynamic design-driven company that would celebrate the glass-making heritage of his ancestors while creating cutting-edge designs and applications, Lasvit’s intention is to bring a little taste of Bohemia to customers worldwide. The tradition of Bohemian glass-working can be traced back centuries and, as a result, Bohemian glass and crystal has to this day retained a special place in the hearts of the most discerning collectors of glassware. As well as its large-scale installations Lasvit has collaborated with a number of renowned designers and artists to create unique glassware collections, from the likes of Nendo, the Campana Brothers, Ross Lovegrove, Daniel Libeskind and Maarten Baas, to Czech design legends René Roubíček and Bořek Šípek. Its designs are made with the precision and traditional mastery of the world’s best glass-makers, while offering whimsical or unique contemporary takes on glassware. 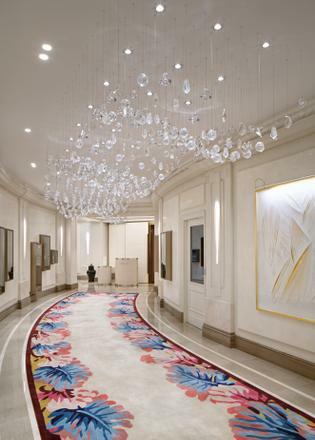 Lasvit’s most recent project has seen the company create a large-scale installation for the Hôtel de Paris Monte-Carlo. One of the most famous hotels in the city, the building has undergone a four-year renovation and expansion project, and Lasvit’s spectacular lighting installation has undoubtedly provided the finishing touch to its new interior design. Lasvit’s new installation, named Magnetic, can be found in three spaces, the main lift lobby, where it will occupy a space of 8m x 2m, and at two places in the Circulation Rotonde on the ground floor. Designed by a young and talented Czech artist Libor Sošťák, the creation imbues the entire space with a magical atmosphere, providing a striking feature as it shines above the heads of both guests and staff. 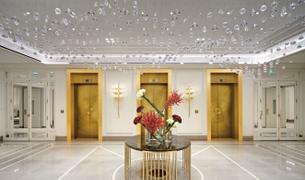 The installation will join other Lasvit pieces already in place at the Hôtel de Paris, including Štěpán Gudev’s installation that adorns the wellness centre, and the three light fixtures designed by the famous Arik Levy for his Crystal Rock collection, which illuminate the hotel’s Le Grill restaurant. The combination of the works show the extent to which Lasvit can create an atmosphere through its lighting creations, adding to the luxurious aesthetic of a space. According to Jakimič, Lasvit’s goal is to become “the most inspiring glass manufacturer in the world”, a mission that is undoubtedly to be achieved, thanks to its meticulously crafted glass collections and bespoke art pieces. For something truly special for your superyacht look to Lasvit.